Prior to the transformation this garden had no privacy and got little use. 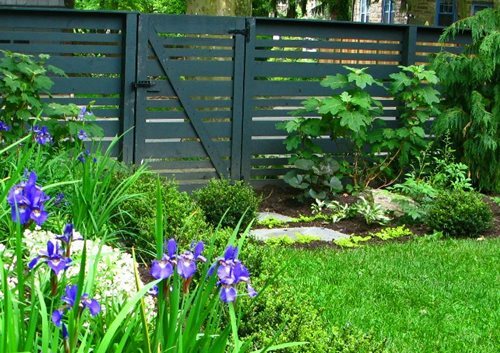 A new fence, with horizontal boards, provides a contemporary privacy solution. 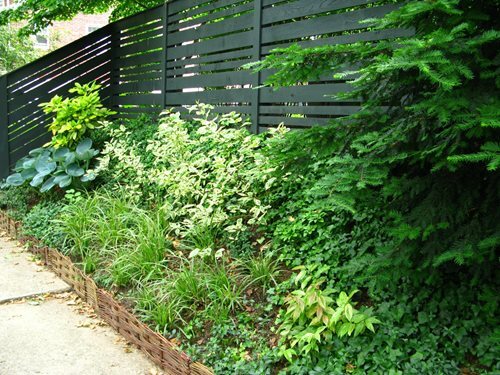 The black fence provides the perfect backdrop for perennials with bold, variegated foliage growing along the sidewalk. 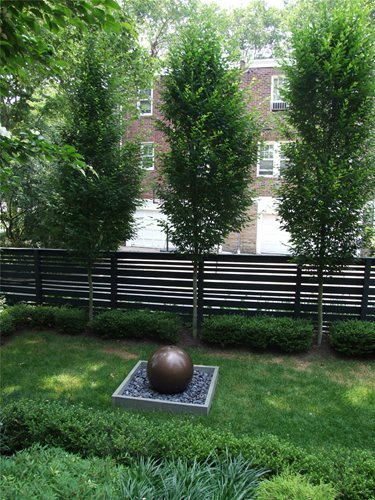 The rear garden features a zen-like fountain and hornbeams for additional privacy. 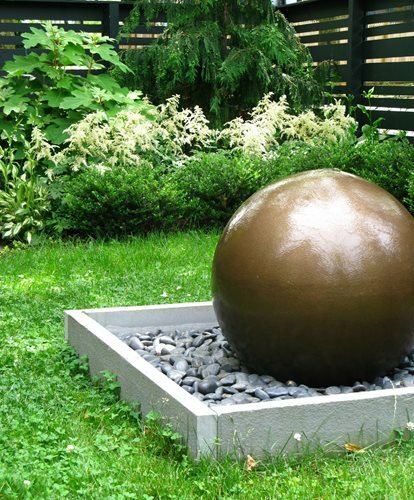 The custom pondless fountain consists of a bronze sphere set in a bed of black polished stone. An L-shaped sofa and a dining table stained to match the fence were used to furnish the patio. Playful chairs from Anthropolgie and a stone top table were added to the front porch. Metallic containers planted with perennials and red impatiens coordinate with the cushions on the sofa. The use of bronze and copper accents emphasizes colors found in the stone on the house. A before image of the overgrown slope and the area that became the patio garden. What do you get when you combine a privacy-lacking 1930's Tudor revival, a homeowner with contemporary tastes and a landscape designer with a reputation for creating world class residential gardens? You get a garden that is visually attractive, calming and quiet. You get a garden composed of a series of well-defined, private outdoor spaces. 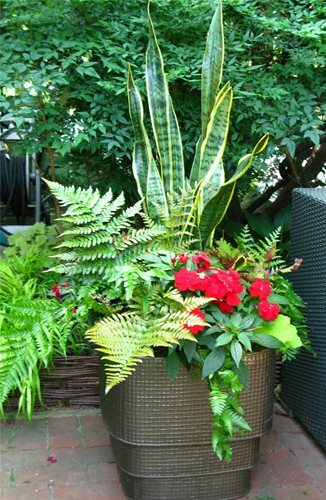 You get a garden full of dramatic plants and modern containers. But most of all, you get a garden that provides the homeowner with a relaxing retreat and invites her to lead an outdoor lifestyle. 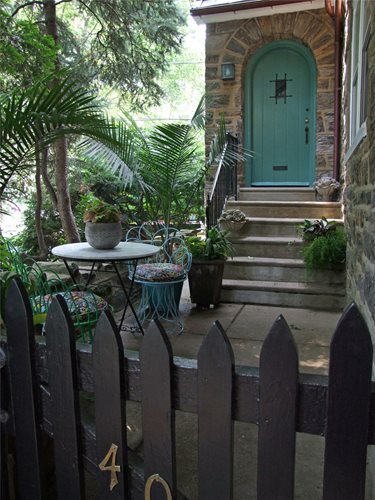 When Maria Hasenecz of Livable Landscapes first arrived on this property in the Mount Airy neighborhood of Philadelphia, the garden was overly exposed and had an overgrown slope covered in multiple types of groundcover. After discussing the client's desires for the landscape, Hasenecz began coming up with ways to overcome the site's challenges and transform the space into a relaxing retreat. Creating Private Spaces"Because the house is situated on a hill, privacy was a big issue," recalls Hasenecz. The homeowner rarely spent time in her yard because of an undesirable fishbowl feeling. "Also, the home sits on a corner lot, so we had to devise ways to downplay the sound of traffic and hide unwanted views," she says. The solution was to install a six foot privacy fence that would screen the property from the rest of the neighborhood. 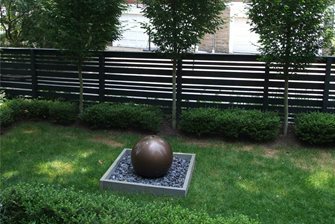 The homeowner opted for a unique horizontal fence style that catered to her contemporary tastes. "The horizontal fence boards mimic brick and stone patterns present on the exterior of the home," she explains. While still creating privacy, the openings between boards keep the space from feeling totally enclosed. 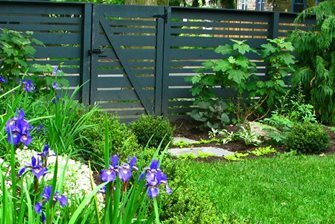 Hasenecz chose to stain the fence black because she wanted it to serve as a dramatic backdrop for the plants she selected. Since the lot is oddly shaped, Hasenecz divided the space into distinct zones. The areas she created include a sidewalk garden, a front garden, a furnished front porch, a woodland walk, a patio seating and dining area and formal back garden. All are nestled in a distinctive mix and lush abundance of trees, shrubs, bulbs, grasses, tropicals and perennials that afford blooms, fragrance and high foliage contrast and a sustainable wildlife habitat for birds. 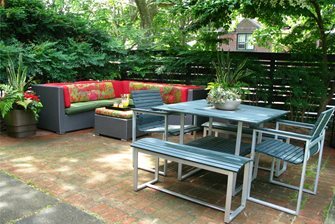 The patio and rear gardens get their privacy from the fence, while the other areas gain privacy from planted screens of hedges and trees. "Most of this property is shaded by sycamore, maple and spruce trees," says Hasenecz. 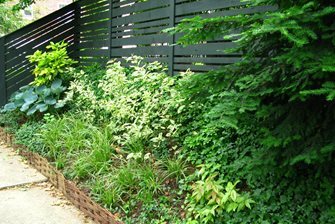 In order to brighten the garden, she planted many variegated perennials such as Gold Dust (Aucuba japonica), Hosta 'Sum and Substance' and Carex 'Ice Dance'. Get a list of shade plants. Not only concerned with the space inside the fence, Hasenecz wanted to ensure that the public areas of the garden had high visual impact. On the outside of the fence she planted bold plants with variegated foliage that contrast well with the black boards. Taming the SlopeAnother problem that Hasenecz solved was the overgrown slope. Without room in the client's budget for retaining walls, she elected to use plants to hold the hillside in place. 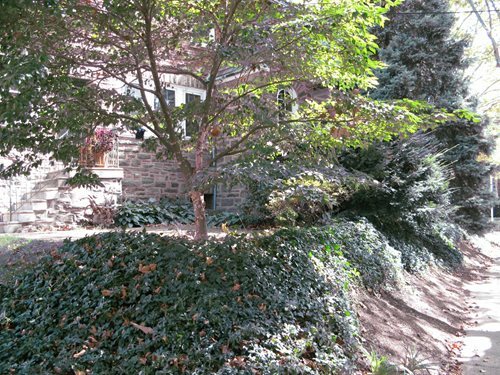 "We tore out most of the existing groundcover, keeping the ivy in some spots," she explains. Then new plants, including Carex, Variegated Dogwood and Hostas, were added to stabilize the slope and create aesthetic appeal. Furnishing & Decorating the SpacesThe patio and rear garden serve as the outdoor living areas for this home. 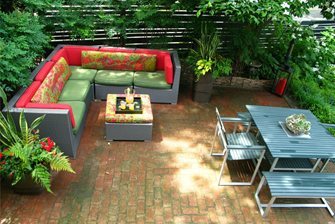 An L-shaped sofa and ottoman provide a comfortable space to sit and enjoy friends, watch birds and simply relax in the new garden. 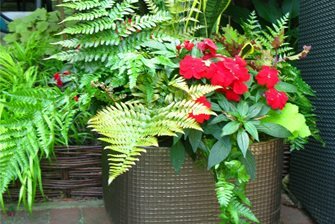 Containers planted with perennials and red impatiens coordinate with the red in the Marimekko print on the cushions. The homeowner heightened the impact of their existing patio set from Ikea by staining it to match the fence. 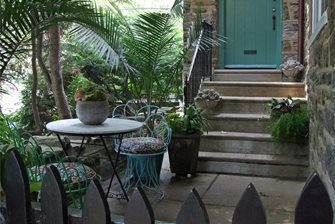 Hasenecz placed festive, modern bistro chairs from Anthropologie on the front porch. Hasenecz took color cues from the stone on the exterior of the home. "The home is clad with Wissahikon schist, a local variety of stone with variable, metallic colors," she says. These colors inspired the selection of the bronze finish for fountain and containers used in the garden. 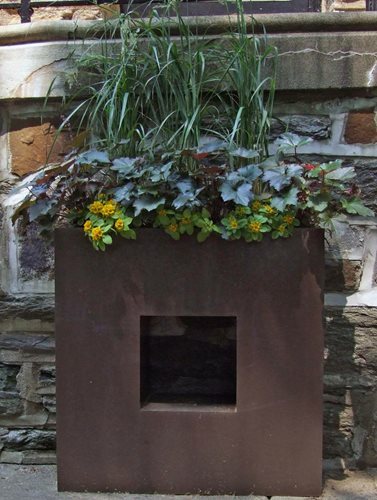 Other decorative elements include a water feature and contemporary containers. The pondless fountain in the rear garden adds an element of relaxation as well as softens the hard lines of the fence and hedges. 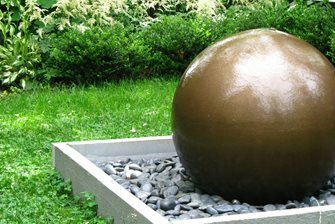 "In order to create a zen-like look, we went with a bronze sphere set in a bed of black polished stones," says Hasenecz. Containers were placed to accentuate the key areas. A prime example is along the staircase wall closest to the patio. 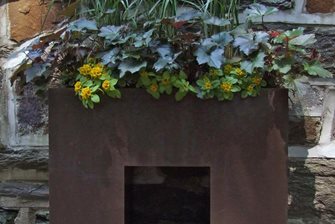 "For design consistency we selected all modern planters in copper and bronze finishes," she says.